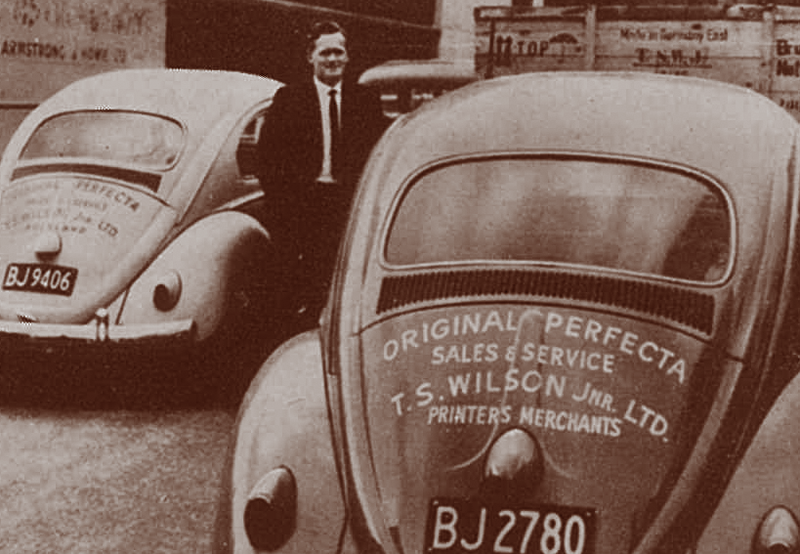 While Tom Wilson’s work experience didn’t quite match his fathers, a UK-trained printing engineer, he still managed to establish a thriving business for the printing industry using a variation of the family name. His father, the late Tom Samuel Wilson senior founded Christchurch-based TS Wilson Ltd in 1921, where his son worked between 1946 and 1954. He learnt about printing first hand, attending many difficult site machinery installations. Today he is the senior Tom Wilson in the family, but he started his career as a store man/costing clerk at age 18 on 16 shillings a week working for his father. When the union came through and signed him up under compulsory membership, his wages went up to the princely sum of two pounds. His father wasn’t pro-union and was reportedly furious, but could do nothing about it, Tom adds with a laugh. In 1954 Tom and his mate John Gordon left for their big OE to the UK and Europe where he picked up a couple of available machinery agencies with the intention of “selling” them back to his father when he returned to New Zealand. “I thought I could pay for my year in Europe and help Dad out at the same time,” Tom laughs. On his return, however, Tom found that his father had made good the threat he made before the younger Tom left, and sold his business that he’d established in 1921 to a larger Auckland based company with its roots in Australia. With it went access to the trading name that eight successive generations of TS Wilson’s previously enjoyed. Undeterred, Tom started T.S. Wilson Jnr. Ltd. using the two agencies he signed up on his OE as its base. Tom says that good agencies were hard to come by when he was overseas because the larger and better known ones had long been snapped up by bigger Australasian companies. Dold numbering machines for letterpress presses and Grant Projectors which served the advertising industry were available and he promptly signed them up. “I did pretty well with both. I would travel by coastal trader to get to customers in cities with major ports, and later relied on Volkswagens with their 15 inch rear wheel drives to get me to places like Napier where the roads were awkward at the best of times,” Tom says. 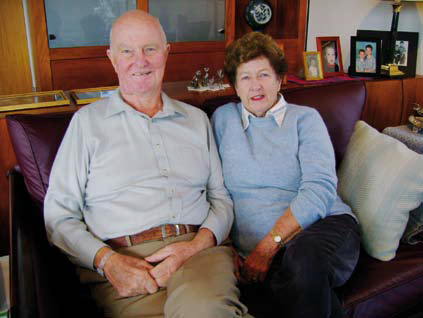 With his wife Margaret (now of 50 years) coming in to provide invaluable support in the office for many years, and a Telex machine shared with a neighbouring business, he was able to grow TS Wilson Jnr Ltd to a level where it was truly, well established. Tom later added the original Perfecta guillotine agency to his stable, selling well over 100 guillotines to printers throughout New Zealand. At a time still regarded as post-war, T S Wilson Jnr Ltd was one of the first companies to bring to the market a Japanese manufacturer, introducing photo processing manufacturer Dainippon Screen to New Zealand, and with them controlling 80% of that market for many years. Later he established the Komori printing press agency. Tom says he first heard about Komori printing presses while attending the inaugural DRUPA trade show in 1963 and as he was shortly travelling to Japan on other business, telephoned them when he arrived. 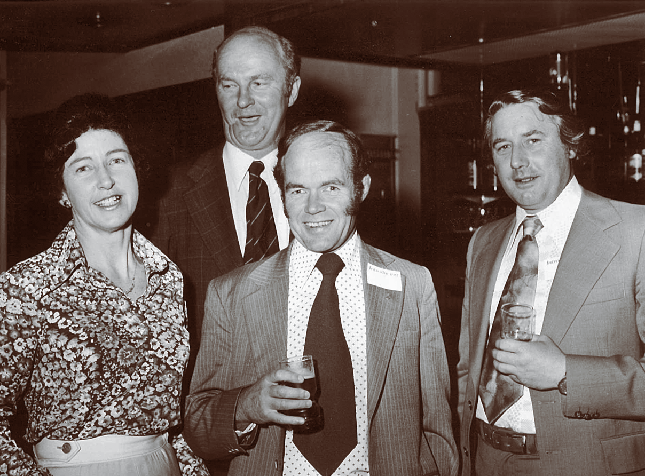 What followed was the start of a fruitful relationship, setting Komori up in New Zealand. T.S. Wilson Jnr Ltd’s respected salesman Barry McNeil with company cars and soon to be installed guillotine, still crated. (C. mid-sixties). Times have certainly changed since Tom Wilson started in business. Sadly, he says, business ethics have also changed.Deals were done on a handshake then, but the various pressures of doing business these days sees the requirement of getting everything in writing and signed off. Similar disappointments include the cancellation of this years Printech exhibition which should have been staged this month in Auckland. “We were one of the very few who really wanted this exhibition to proceed. Stifled primarily by multinational supply firms not willing to back the New Zealand printing industry, we further stress the reasoning for industry to support the locally owned firms such as ourselves. He says that his sons, Steve and Geoff who now run TS Wilson together, have a good understanding of the business’s core values of honesty and integrity. Tom and Margaret now enjoying retirement. Steve’s background is in pre-press which has enabled him to develop skills beneficial to the company in offset and digital environments. Along with his management studies and stewardship of the company for the last ten years he and Geoff compliment and support each other to an enviable level. “This company has two very good people driving it forward,” Tom adds. TS Wilson provides back-up service from factory trained personnel and has an impressive spare parts inventory. “We import press consumables often by the container load and command a healthy respect with the quality products we supply. We are well resourced and our size enables us to be flexible. It’s tough in these times, but we are capable of rising to the challenge without losing focus,” says Steve. Today’s TS Wilson proudly represents the solutions oriented Japanese manufacturer Duplo as its primary print finishing equipment partner, offering to industry many and varied options covering as they have for years, on-line, off-line and near-line binding and sheet handling systems boasting many market leading benefits. In June 2013 the New Zealand print industry mourned the loss of Tom, who had been diagnosed with leukaemia three months prior. Steve says he passed away quietly with family present. Although Tom officially retired in 2007, he still found time to go in to the office. He said, "We had a lot of fun in industry and a lot of customers became good friends." 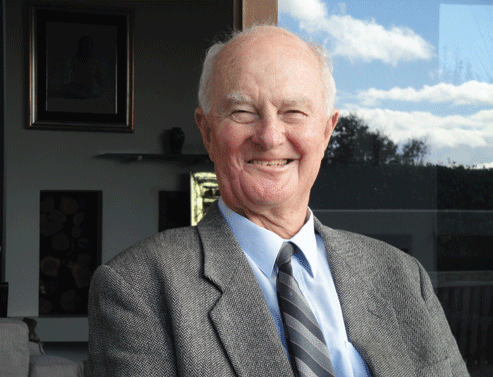 The New Zealand print industry has mourned the passing of one of its ground breaking print suppliers, Tom Wilson, the founder of specialist finishing supplier TS Wilson Jnr. The company, which has played a significant role in introducing new print equipment to the New Zealand market, remains in the hands of Tom Wilson’s sons: Steve and Geoff Wilson. Steve says that three months ago his father had been diagnosed with leukaemia. He passed away quietly with family present. A man who would seal a contract on a handshake, Tom Wilson had a long career as a supplier to the industry. He began in 1946 as a storeman and costing clerk for his father’s company in Christchurch, TS Wilson which was established in the early 20’s. In 1954, he returned from touring the UK and Europe, where he picked up a couple of available machinery agencies that he intended to introduce into his father’s business. Despite learning of the sale of this business, he remained undeterred and started TS Wilson Jnr, with Dold numbering machines for letterpress presses and Grant Projectors. He said, “I did pretty well with both. I would travel by coastal trader to get to customers in cities with major ports, and later relied on Volkswagens, with their 15 inch rear wheel drives, to get me to see our customers in places like Napier where the roads were awkward at the best of times.” He also represented Original Perfecta guillotines in the early days with over 100 sold. Steve says his father’s philosophy continues today by way of the 20 year relationship with the Japanese manufacturer of print finishing solutions, Duplo.